This soap-free shower gel surgras, the floral fragrance and rich foam cleanses the skin without drying. Its cleansing base has been formulated with agents surgraissants to leave a velvety feel to the skin.Rich in salicylic acid, these two plants possess anti-inflammatory and soothing properties. 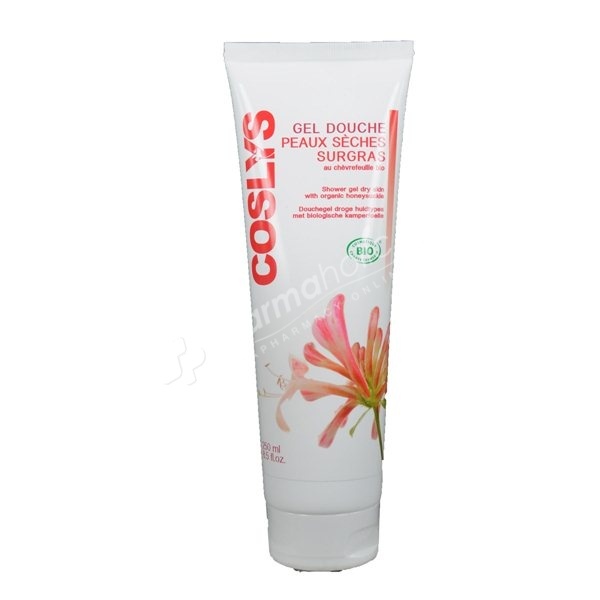 This ideal shower gel for daily use, leave your soft, smooth and pleasantly scented skin. Enriched surgras agents, shower gel soap cleanses the skin without drying. The skin is smooth and pleasantly scented. This soap-free shower gel surgras, the floral fragrance and rich foam cleanses the skin without drying. Its cleansing base has been formulated with agents surgraissants to leave a velvety feel to the skin. Floral water Meadowsweet is a local plant that grows along the river. Honeysuckle is a vine that grows along walls, fences, trees and hedges. It is traditionally used in China as a treatment for certain skin conditions. Rich in salicylic acid, these two plants possess anti-inflammatory and soothing properties. This ideal shower gel for daily use, leave your soft, smooth and pleasantly scented skin. Apply to wet skin, lather and rinse thoroughly. In case of contact with eyes, rinse thoroughly with clear water. aqua (water), Spiraea ulmaria flower water * (floral water meadowsweet bio), sodium coco-sulfate (anionic surfactant derived from coconut, palm kernel and glycine), lauryl glucoside (non ionic surfactant from glucose) stearyl citrate (alcohol and citric acid ester), polyglyceryl-2 laurate (surgraissant agent derived from palm and coconut), Lonicera japonica (honeysuckle) flower extract (water extract of honeysuckle floral japan), coco-glucoside ( nonionic surfactant derived from coconut), nonionic glyceryl oleate (surfactant derived from coconut oil, sunflower oil, vegetable glycerin and glucose), cocamidopropyl betaine (amphoteric surfactant derived from coconut), benzyl alcohol (preservative), sodium lauryl glucose carboxylate (anionic surfactant on sugar base), fragrance (perfume 100% natural origin), sodium chloride (salt), coconut alcohol (coconut alcohol), sodium sulfate (anionic surfactant derived from coconut), potassium hydroxide regulator pH), dehydroacetic acid (preservative), Oryza sativa extract * (from grain organic rice), sorbic acid (preservative), Leuconostoc ferment filtrate (close), superoxide dismutase, soybean peroxidase, benzyl salicylate (preservative system) , geraniol, limonene, linalool (components naturally present in essential oils).